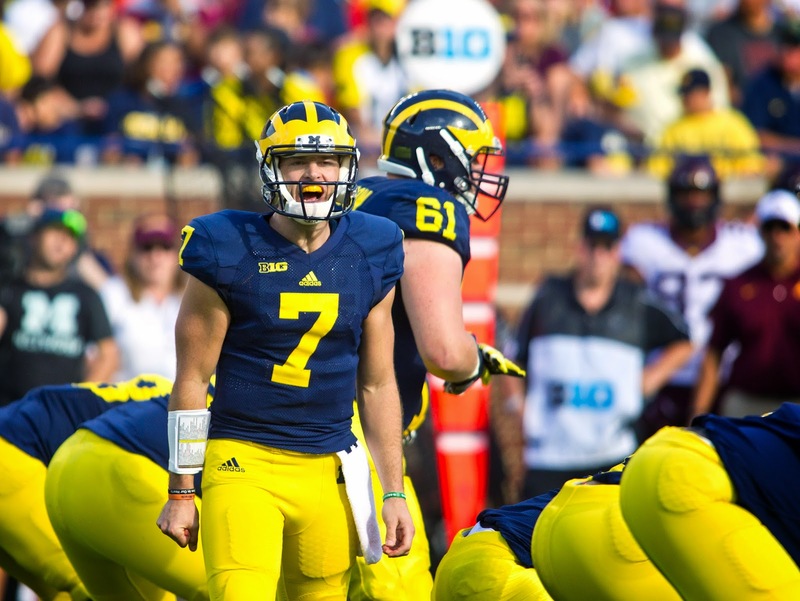 - That Minnesota moved down the field in its two-minute offense for a field goal is decidedly disappointing, and points to a certain lack of competitive character on Michigan's part. Come on, what did the Wolverines' defense do, just take the last minute of the half off? That is not winning football. - Watching the first half of this game makes it evident why Big Ten football is struggling overall. There is little imagination for either one of these teams offensively. You don't have to be Nick Saban to figure out when these teams are going to run or pass. You can simply tell by whatever formation they are in. Thing is, both these defenses are pretty good, but hardly dominant. Just like last season, Minnesota's one-dimensional rushing offense plays perfectly into the hands of Michigan's defense, which is not strong in the secondary, but has stout front four and an excellent linebacking corps against the run. - De'Veon Smith is running exceptionally hard and looks like he really, really wants to be the Wolverines' prime ball carrier. - Shane Morris has not passed that well in this half, but in fairness to him, it's not like he is missing a lot of open receivers. The lack of separation by Michigan's receivers is alarming especially when they take shots deep. I do think Morris a better runner than he is often given credit for. Looks like he has pretty good straight line speed.